We here at Fraserview Dentist are currently accepting new patients at our dental clinic in Vancouver at Fraser St. and East 48th Ave.
We focus on helping families with their general oral health through regular checkups but offer all major services including, preventative dentistry, implants, sedation, Invisalign® treatment, and cosmetic enhancements. Please note that we do ask all new patients to have an initial checkup with us before we can address any other issues. This is important for us to gauge your overall oral health, and to get a good idea of any other aspects of your overall health that may complicate further dental procedures. Read more about this in our section below titled: Why do we require an initial checkup for new patients? If you would like to become a new patient at Fraserview Dentist, or are an existing patient who is looking for a check-up, fill out the form below with your contact information and any important notes or questions and we will reach out to you as soon as possible. Fill out the form below with any questions or comments you may have, and we will contact you shortly. Why do we require an initial checkup for new patients? When you meet with us for the first time, you will typically have an initial checkup and regular cleaning. Though you may know that you’re dealing with a more serious issue, such as gum disease or tooth decay, we generally prefer to schedule a basic checkup for your initial visit. This gives us a chance to evaluate your dental health, discuss any issues, and develop short and long-term treatment plans that suit your budget, needs, and preferences. This initial appointment serves many important purposes. As a new patient, you may come with a dental file that has lots of blanks to fill in. If possible, contact us in advance to transfer your dental records from your previous dentist. This will give us a head start in this area. If you don’t have a prior file to transfer, try to remember the last time you had professional dental care and what was involved in previous visits. We may have lots of questions for you at your first visit. It’s important that you try to answer these openly and honestly. Though you may not know it, there are often important connections between other health conditions and your dental health. Patients with heart disease or those on blood thinners will have special considerations to address before major procedures are performed. Your care plan also will be different if you’re pregnant or plan to become pregnant. Give us as much information as you can so we can develop an effective and highly personalized care plan for you. One Canadian survey revealed that more than 5 percent of respondents were very afraid or terrified of the dentist, while nearly 10 percent were somewhat afraid. If you’re among those patients who experience dental anxiety, it may help to get to know our team during a routine visit. The initial checkup and cleaning are easy processes, with little to fear, which gives you a great opportunity to meet our receptionist, our dental hygienists, and our dentists. It’s important to work with a dental care team that makes you feel comfortable and we want to help you ease your anxiety and make you feel more relaxed in the chair. We are currently accepting new patients, and if you’re looking for a new dental team in the Fraser Street area, give us a call to find out how we can meet your needs. Your initial visit includes a thorough examination of your mouth. This includes a look at the gums, mouth tissue, face, neck, lymph nodes, jaw joints, tongue, and teeth. 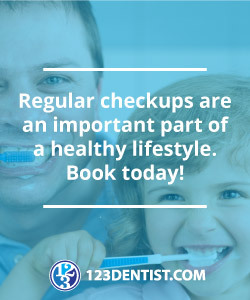 We will check your bite, look at any prior fillings, watch for loose teeth, and examine any dental appliances you may have. Most times we will also take an x-ray of your teeth. This will help us spot any pending problems, such as loosening gums, developing tooth decay, or deteriorating fillings. The sooner we catch a dental issue, the easier it is to treat. Dental care rarely features a one-size-fits-all solution. There are several different options you can explore if you’re experiencing dental problems. Fillings come in many variations, such as gold, silver amalgam, and tooth-coloured resin. If you have missing teeth, you may be able to get an implant, partial denture, or bridge. For whiter teeth, you may try an at-home treatment, professional tooth bleaching, or veneers. During your initial visit with us, we’ll help you explore all the options that are available to you. We’ll help you develop a treatment plan that’s right for you, whether you’re interested in maintaining an already healthy smile, treating gum disease, straightening your teeth, repairing decay, or managing some other issue. Regular dental cleanings are essential for a fresh, healthy smile. You should plan to schedule a preventive cleaning typically once every six months. During this visit, our hygienists will clean your mouth thoroughly, helping to reach areas that your regular brushing and flossing might miss. This includes removing plaque and tartar, polishing your clean teeth, and carefully flossing in between teeth. Your cleaning may reveal areas that you could have reached on your own but missed and our staff will be happy to review proper brushing and flossing techniques with you and help you address these tricky areas to make sure you don’t miss important spots in the future. Your first dental cleaning with us will give you a fresh smile and valuable information about how to maintain it. If you’re overdue for dental care or looking for a new dentist to serve your needs, schedule an initial check-up and cleaning to get started on your journey to a healthier smile.